With performance roughly similar to that of the American B-58 Hustler, the BLINDER was capable of supersonic dash and cruises at high subsonic speeds, At least three major variants of the BLINDER entered operational service in the Soviet Air Forces — a free-fall bomber, an ASM carrier, and a photo/electronic reconnaissance variant. This supersonic medium-range bomber is a swept-wing aircraft with two engines positioned as the base of the tailfin. The low-mounted swept-back wings are tapered with square tips and a wide wing root. The landing gear pods extend beyond wings’ trailing edges. Two turbojets engines are low-mounted on the tail fin, with round air intakes. This eliminated the need for a complicated boundary layer separation system in the intakes, but added a 15% weight penalty, and made engine maintenance much more difficult because of how high they were off the ground. The fuselage is tube-shaped with a solid pointed nose and a stepped cockpit. Tail flats are low-mounted on the fuselage, swept-back, and tapered with square tips. The fin is swept-back, and tapered with square tip. 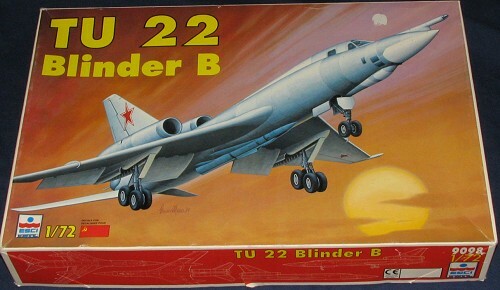 The TU-22 bomber was intended to replace the TU-16, but due to its poor performance it was deemed unsatisfactory. Carrying a similar payload to only a slightly greater range, the Tu-22 offered no real increase in capability. Its limited range was its main disadvantage, though the TU-22K only carried one missile whereas the TU-16 carried up to three. Unreliable and prone to accidents, the Blinder was not built in sufficient numbers to replace the aging Tu-16 Badgers, which remained in service well into the 1970s. Subsequently, KB Tupolev sought to upgrade the TU-22 in the form of a new design [designated "106"] that was supposed to have a range of 6700km, a speed of 2,000km/h and new HK-6 engines. This effort eventually led to the development of the Tu-22M BACKFIRE. The Tu-22 was used by the Soviet Union in the Afghanistan War, and served the Soviet Air Force, and Navy into the late 1980’s. 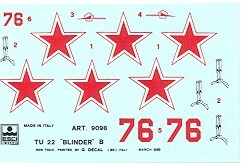 Iraq received about 12 Blinders in 1973, while Libya received their 12 to 18 from 1977 to 1983. They were used by Iraq during in Iraq-Iran War, and by Libya during the conflicts in Sudan and Chad. A number of Blinders from each nation were lost to SAM’s of opposing nations. As of 2000, Ukraine remains the sole operator of the type, with the Libyan, and Iraqi aircraft thought to be unserviceable. Molded in light grey plastic with nicely engraved panel lines, the folks at ESCI put a lot of work and consideration into this kit. Unfortunately for them, it was a major sleeper and Blinder kits languished on shelves for many years. Once AMT/ERTL bought ESCI, the remaining stock was quickly sold off at bargain prices and the kit disappeared for a considerable time. This, of course, delighted the auction folks who sold off their kits at a premium price. Either late last year or early this year, Italeri reboxed the kit and retailed it for $45.00. When that happened, older ESCI kits lost much of their value and so now you can find them at a much more reasonable price. Though a large model, it is surprisingly simple in terms of construction. 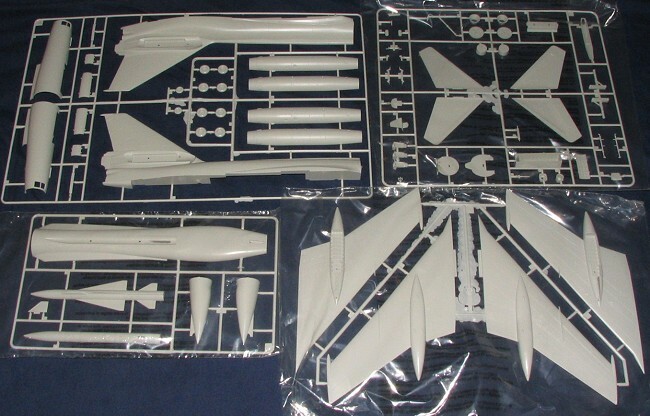 The fuselage is molded in two halves so that box size could be kept to a reasonable size. The cockpit consists of seats (with harness decals) and a control panel with a control wheel sticking out of it. No decal or really reasonable detail for the instruments at all, but I seriously doubt that much will be visible through the rather small canopy anyway. No mention of nose weight is given, and I'd think you'd have to put some in it as it looks tail heavy. The wheel wells are fairly well detailed and like most ESCI kits, the doors are molded in one pie ce in case you'd want to display the model on a stand. There really is no optional bits on this one unless you wish to leave off the 'Kitchen' ASM missile, or remove the in-flight refueling probe as was done to the aircraft near the end of its service life to comply with SALT agreements. Instructions are done by ERTL and nicely drawn with color information provided where needed. Only one marking option is provided, and that is for an overall unpainted metal Soviet/Russian version. It would have been nice to have had either Libyan or Iraqi aircraft as an option as they were painted in a very fetching desert camo scheme. The decals are well printed and unlike most ESCI markings are not yellowed! As with so many large bombers, this is a kit that rarely gets seen built. However, those I have seen have been rather impressive and if you like big honking bombers or Soviet/Russian aircraft in general, then you should seek this one out. Kit courtesy of your editor (who may actually build this thing).